We'll remember 2015 as a year of highs (Jordan Spieth’s victories) and lows (Tiger Woods’ injuries). Below are some of our favorite moments from the last 12 months. Reed smacked a high-flying, deftly arced shot on the 16th hole for an eagle at the Hyundai Tournament of Champions. 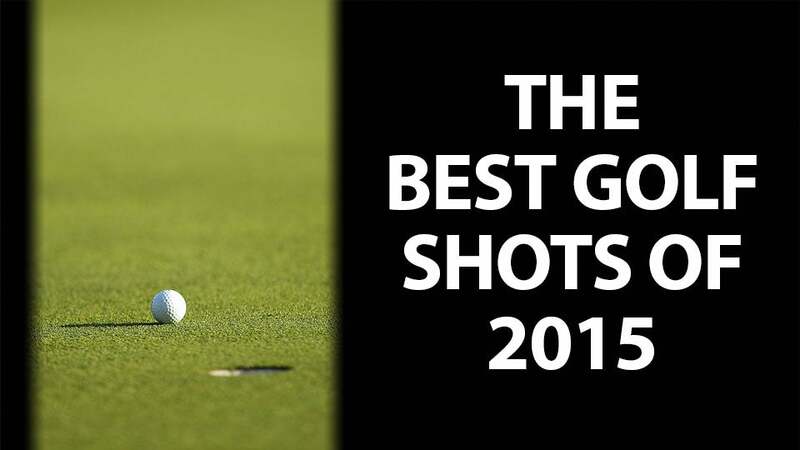 The stunning shot helped him edge Jimmy Walker to win the tournament. In one of his many memorable moments of the year, Spieth hit a picture-perfect shot 48-feet out of a bunker on the 18th hole in the second round of the PGA Championship. At the LPGA's KEB Hana Bank Championship in South Korea, Yang birdied every hole on the back nine. Watson scored a dazzling eagle on an 83-yard approach shot at the BMW Championship. Sadly, it didn’t mean much at the end of the day; he finished tied for tenth. Just after a double-bogey on the 17th hole, Jordan Spieth hit a flop shot from the downslope of the green and over a bunker to save par and a four-shot lead. See it below at the 4:30 mark. After chipping in on the final hole to force a playoff with Inbee Park at the Lotte Championship in Hawaii, Sei Young Kim holed out from 154 yards to win the tournament. In January, the Spaniard sunk a hole in one on the 15th hole of the first round at the Abu Dhabi HSBC Golf Championship. He followed the shot up with a kiss for the camera and a signature Moonwalk-like jig. In May, he repeated the feat with another ace in the third round of the BMW PGA Championship, and of course, another joyful wiggle-dance. With that, Jimenez became the first man ever to record 10 aces on the European Tour. Day sealed a two-shot win at the Canadian Open with this 22-foot putt for a birdie on the 72nd hole. The PGA Tour named it their No. 5 shot of the year. Caught on the downslope of a greenside bunker, Mickelson holed out for an eagle from 36 feet on the 6th hole of the PGA Championship’s final round. In the pressure-packed sudden-death playoff at the Valspar Championship, Spieth stayed focused, sinking a straight-as-an-arrow putt from 28 feet for the win. One of the best finishes of 2015, Rickie Fowler delivered on the 72nd hole at the Players Championship with a “once in a lifetime” birdie to complete a six-under run over the final six holes. Of the putt, one of the commentators had this to say: “It took my breath away.” In a sudden-death playoff, he landed a beautiful wedge shot over the water just four feet from the hole for birdie and the win. On hole 18 at the U.S. Open at Chambers Bay, Jordan Spieth hit an approach shot with a 3-wood that landed 15 feet from the cup. He named this shot one of his favorites of 2015. Although Zack Johnson’s birdie on No. 18 at the British Open was impressive (and gave him the win), it was his caddie Damon Green’s inventive, bird-like dancing skills that made this shot one to remember.